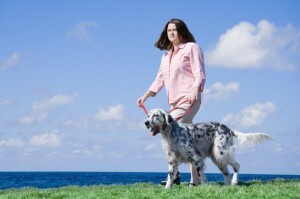 Dog Walks: Are You or Your Dog the Alpha? Daily dog walks are extremely important for the physical and mental health of your furry best friend. Daily walks keep them in pristine physical condition and help to relax their mind – when done correctly. Is there a wrong way to walk a dog? Consider this: When a father or a mother is crossing a street with children or others who are in their care, are they relaxed? No, they are not. They are leaders, and they are responsible for the safety of others, and so they are alert, trying to be aware of any and all potential dangers around them. The same is true of dogs. A dog cannot talk a healthy walk in a relaxed state of mind unless you are the alpha. Who takes the lead on your walks? Do you allow your dog to walk wherever they please, running and sniffing at whatever they want? Or do you make them heel and take the lead yourself, walking your dog where you want to go? This is how your dog will begin to see you as the alpha on your walks, and will be able to relax and enjoy the physical exercise, trusting that you will keep it safe rather than them being responsible for your safety. So remember that your dog should always walk beside or behind you during your daily walks, and any alpha behavior should be immediately corrected. This is a natural order of things for dogs, and they instinctively view your family as their pack. Teach them that they are a pack member, and not the pack leader, and they should get along with your family just fine. Don’t have time to walk your dog everyday? Why not have us do it for you? Or join in on our small dog group walks. Give us a call for more information.